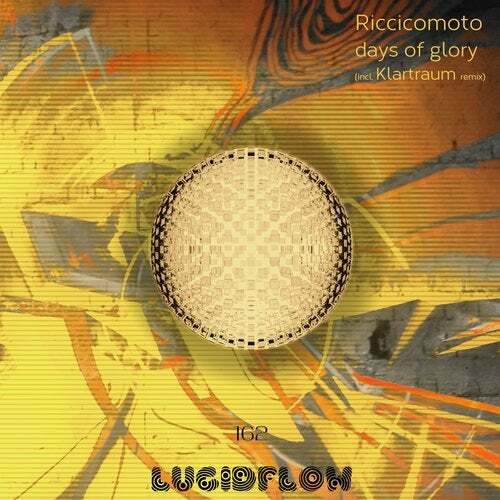 Riccicomoto returns to Lucidflow and the lounge-dub specialist deviates from the template of his long players in order to focus a lens on the dance floor on 'Days Of Glory'. Of course don't take this as being a simple collection of kick drums, the full spectrum, widescreen approach to production is still in full effect here.Take the lead track 'Days Of Glory Dub Session 2019' for example, where the bass line is so incredibly dominating that you would think that there would be no further room on the sound stage with such a presence. Yet deft piano notes, breathy refrains and granular synths all drift into the atmosphere. 'Those Who Be Happy Dub Session' follows afterwards, this time playing to the aquatic side of the dub genre. Everything is amniotic, comforting and aqua in nature. Keen ears may pick up the faintest hint of tape hiss in the background, which makes it sound like the music is set to the patter of rain on the window, which is notably one of the finest naturally occurring soundtracks to relax to.Next up, 'From Another Planet Dub Session' is similar in mood, but more urging in nature. Rather than concentric, the dub stabs form a part of the percussive momentum. It is a pleasing detachment from reality and a moment for reflection. Then, 'Shake Em Down Dub Session' digs out some pre-millennium progressive stabs and throws them in to a gnarled and chewy session. It is the hedonistic pleasure groove of the release.Finishing up a fully featured six track extravaganza is Nadja Lind and Helmut Ebritsch with a Klartraum remix of 'Those Who Be Happy'. Their touch is subtle, fattening out the beats, dialling up the brightness and emerging from the rainy hiss with sunny clarity. 'Days Of Glory' will be available on 1st April 2019 from the usual digital stockists.